Sometimes what looks like a picture of peace is a symptom of war, or military occupation. 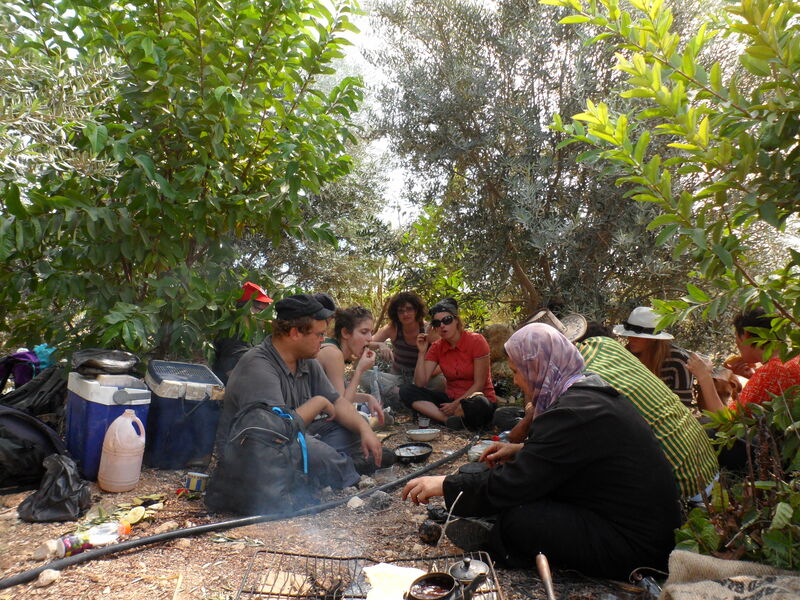 What could be more like a picture of peace than a group of Israeli volunteers taking a break in the olive grove of a Palestinian family who have prepared lunch for their guests who have given up their Sabbath to help with the olive harvest? Representations of peace have a limited iconography to draw on: the dove, olive branches, lions lying down with lambs, mothers with children, and pastoral scenes in general. So, surely all the right buttons are being pressed in this picture of Israelis and Palestinians sharing a meal cooked on an open fire under olive trees. Surely this is peace? No, it isn’t, because the photograph doesn’t tell the story of how this group of Israelis came to the land of the West Bank village of Jayyous on this late summer day. It doesn’t tell the story of how the Israeli separation wall cut off the villagers of Jayyous from most of their land, and how those villages have to obtain permits from the occupation authorities to pass through the two agricultural gates in the wall which are opened and closed by the army. It doesn’t show the map of how that security wall departs from the green line marking the 1949 armistice line between Israel and the West Bank, such that it wraps a noose around the Palestinian town of Qalqilya and zig-zags crazily by Jayyous that lies nearby. Nor does it tell the story of the Eyal checkpoint through which Palestinians from Qalqilya with permits may pass to work in Israel if they are prepared to get there by 4 am, be patient, and subject themselves to the rigorous security checks. That is a story told by Machsomwatch and its members. Yet, the photograph and the event are both pictures of peace in another way. The Israelis (and some overseas visitors) have found a small, practical way to compensate their Palestinian neighbours for the damage to their lives and livelihoods caused by the separation wall, through an organization called the Olive Harvest Coalition. And the Palestinians of Jayyous have been willing to accept such help from citizens of the state that creates such harsh facts on their ground who had come in place of all those family members and other villagers who do not have permits to cross through the wall. As we spent our day picking olives and taking breaks for food and hot, sweet tea, working under the patient supervision of Ali who had to stretch his Hebrew to direct us, it was hard not to feel peaceful. No doubt there are plenty of Israelis who would think it dangerous for us to put ourselves in the hands of Palestinians, but the only danger was the perilous ride on the overcrowded tractor and trailer. In the midst of all this seemingly intractable conflict between two nations, a dozen or so Israelis could be the guests of Ali, his wife and son for a day, without mutual suspicion, or anxiety, or fear. It was so peaceful that not even we Israelis found anything to argue about. Maybe one day Ali and his neighbours will run a service offering fun days out for Tel Aviv families to experience the olive harvest in Jayyous. But there’s a wall that has come down first.